Why am I different from other sellers? So... I was thinking about all of the sellers out there that make "flower clips" and trying to put into words why someone should want to buy my work over someone else's. I came up with a couple of important points. First, I'm an art teacher by day, artist by night. That means I have a good eye for design and composition. When I make a flower, I combine petals from a variety of different flowers and styles to create flowers with a sense of realism and a natural feel, even when I choose to utilize unusual or unnatural color combinations. Look closely at the flowers made by other crafters... I think you'll begin to see a pattern of monochromatic, radially balanced designs. Not that there's anything wrong with that - it's just not my style. They often look too cartoony and like the flowers you could pick up at any Claire's boutique (again, nothing wrong with it... just not my style). 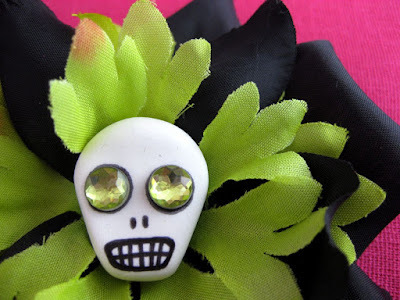 Another unique detail is the skully flowers. I make each skull by hand using air-dry clay, and then draw/paint the skull faces on and sometimes add rhinestones. I can make two skulls that look alike, but no two are ever exactly the same! 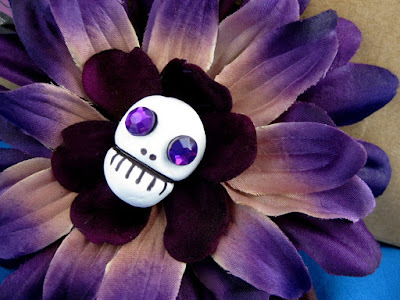 These skully charms are something that I have not seen anyone else create. Hopefully I won't see anyone else creating them, because that means they ripped off my idea! 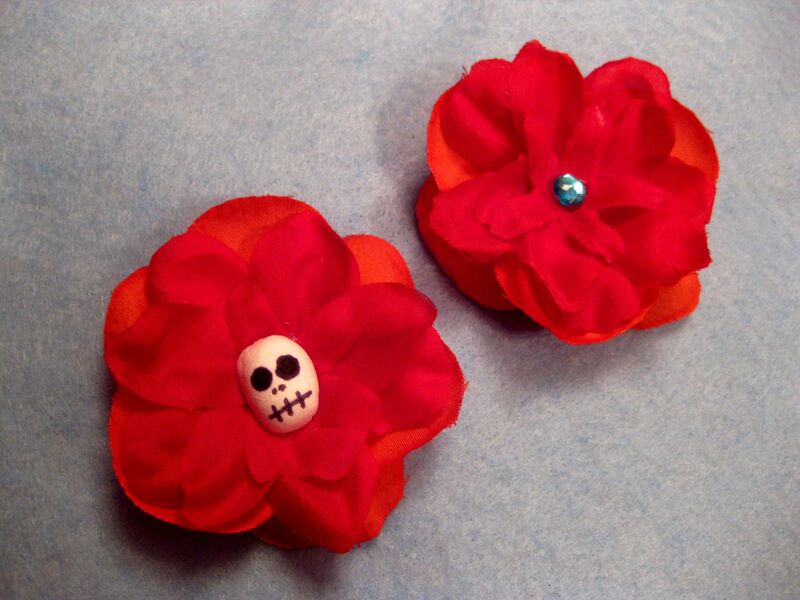 One last thought is that I "back" my flowers with sturdy felt and two different fastening options: one clip, one pin. The clip is fastened under the felt, so if you clip a flower to your hair, it won't get snagged or caught on any glue. Having an additional pin means that you can wear a flower on a jacket, sweater, winter hat, purse, scarf, headband... just about anywhere! So you always have lots of options. I think all three of these points prove why Hell Razor is unique from the majority of the floral creations you will see in other shops. Hopefully you agree. In fact, I may start posting a short version of this statement on our Etsy listings. Sometimes it's hard to decide who to purchase from when things seem similar, so now you know why to go with us! I never seem to be satisfied with something for very long, be it at work, at home, or at play. I need to push myself further and try new things. It doesn't always need to be a major change - sometimes a little switch from the norm is all it takes. My skullys are all hand-crafted by me for use on flowers and bows. Puffy heart necklaces are hand-sewn and stuffed before becoming pendants. Rosaries and other jewelry are often one-of-a-kind due to the recycled/vintage nature of some parts. 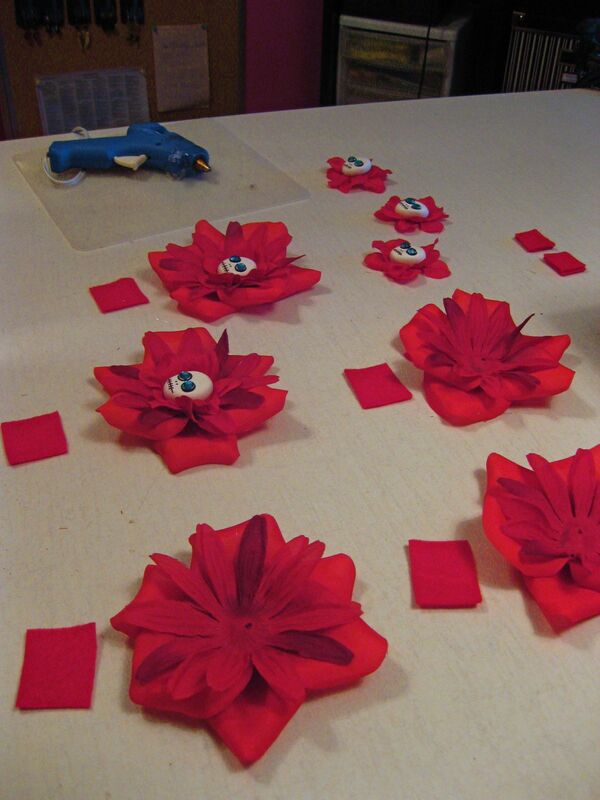 I taught myself how to make fabric flowers. 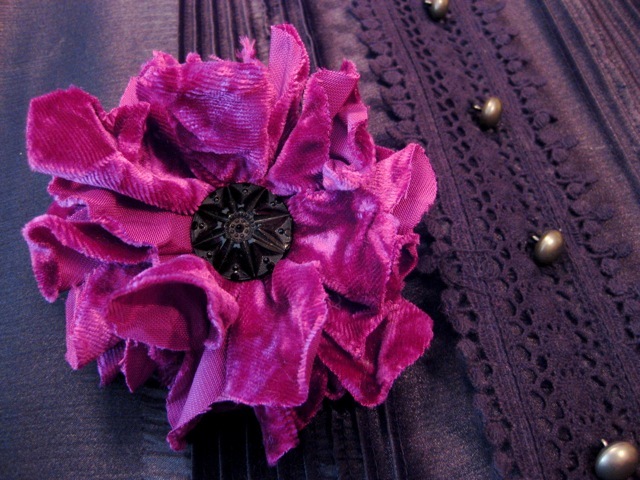 Currently, my flower clips are made from an amalgam of faux flower petals - which are cool - but I wondered how to make them even more unique... this flower is cut from a scrap of crushed velvet material. I like the fluffiness. I even debated going sans-button, but decided to go with the whole "more is more" approach. I'm happy with it. Even finished off the backside with the usual clip and pin combo. I'm thinking that some of these could make nifty holiday gifts for my friends. Can you see the grooves of the vinyl? I used Todd's jeweler's saw and filing tools to create this one, then made the rest of the necklace from a combination of recycled vintage beads. 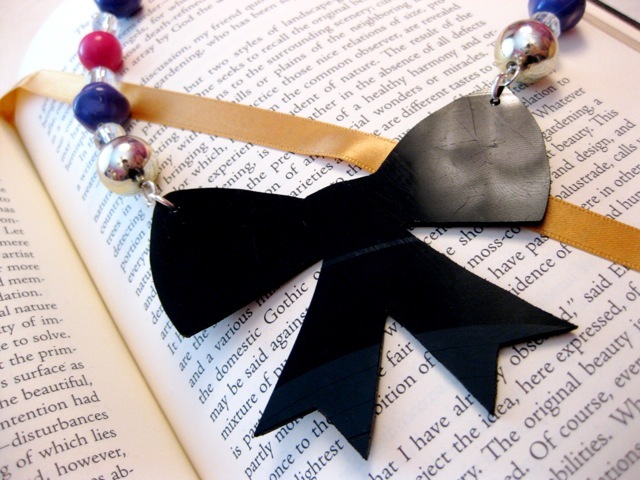 I cut old necklaces apart and use the beads in new combinations that make them look more fresh and modern. The reflection on this pendant came out great - you can really see the record grooves! 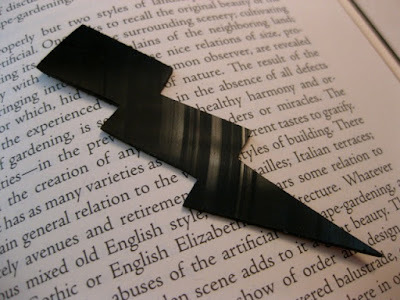 It still needs a necklace to accompany it, but I think this pendant is fantastic! I have a couple others rough-cut and in need of filing, and several others in various stages of cut/uncut, so I hope to have some finished items to put up for sale soon. Congratulations to Amanda who won the Bake & Destroy! 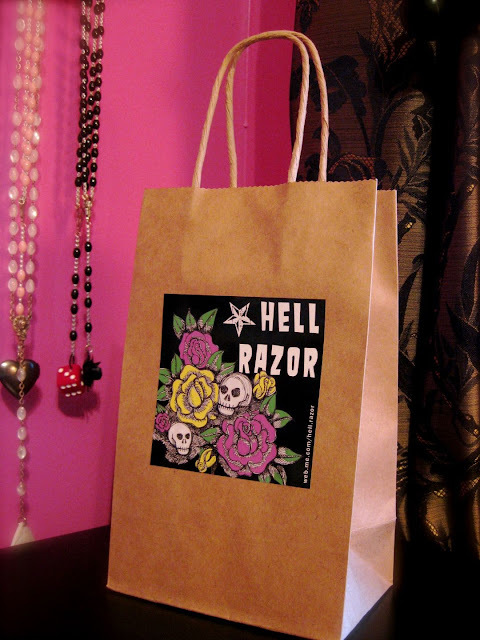 Holiday Gift Guide & Giveaway Hell Razor prize: the Cupcake Flower Clip & Pin! 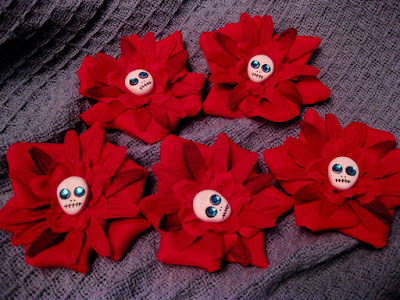 What's awesome about Hell Razor flowers is that they can be worn in the hair, or pinned to any other surface. The back has a single prong hair clip and also a pin closure for versatility in wearing. The hair clip is securely attached with felt for comfort in wearing and prevents hair (or other surface) from getting snagged. I figured since her site is called BAKE and Destroy!, I'd make my giveaway somewhat baking-related, hence the little cupcake guy in the middle. I've been following Bake & Destroy! for a little while now, she always has delicious cupcake recipes and fun ideas. The one that really hooked me though was a video she did about her SodaStream machine - you can make your own freaking soda with it! How cool is that? Anyways, I became consumed by the idea so much that I ordered one of my own and I love it. Even though I'm cutting back on caffeine there are still lots of fun flavors I can choose from - orange mango is my current favorite, but I also like to make the lemon iced tea... it's fizzy! So, be sure to check out Bake & Destroy! 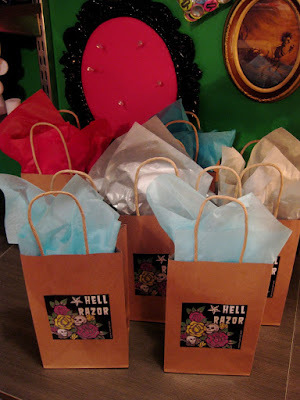 's Holiday Gift Guide & Giveaway to win a free Hell Razor cupcake flower, and check out all the other cool gifts as well, because she has some neat ideas. Don't forget to place your Hell Razor order for the holidays as well! As the date grows closer, I can't guarantee arrival by the holidays, so buy now! Enter coupon code FACEBOOK between now and December 31st to receive 15% off your order! I did it! My first craft fair was on Thursday at Emerson Elementary. 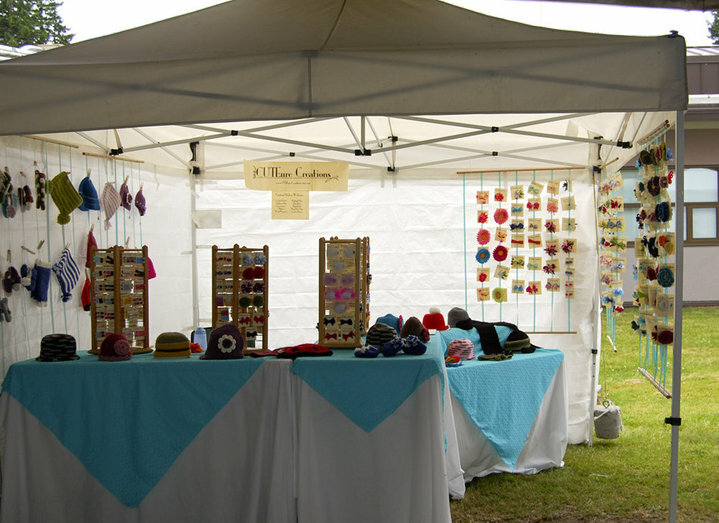 I took a picture of my booth before it started - I think it turned out really well! 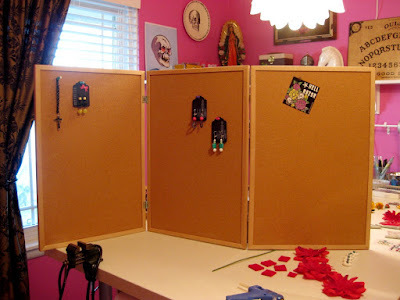 The bulletin boards ended up just barely tall enough that I could see over, but I was able to conduct most business over the purple photo frame. Many friends showed up and bought stuff - thanks Laurie, Gerry, and mom! But I met some new friends too, including Claudia who makes Whimsys. They're these really cute plush animals in crazy patterns and colors. She gave me a sweet plush skull in white and purple, my favorite! It was a crazy week with so much else going on personally, I feel very accomplished that I was able to squeeze in the craft show as well. Thanks for your support! 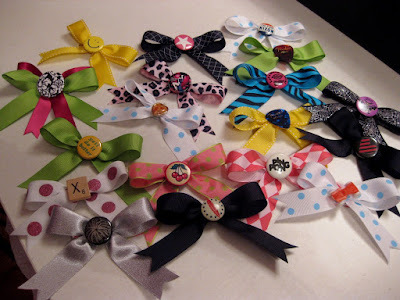 In addition to some older items that didn't sell at regular price, I'm whipping up some NEW simple bows to sell at the Shops of Emerson for $5 - see sneak preview above! My goal is to do a $5 sale, where EVERYTHING I bring will be $5. I think it will enable people to grab several items for a variety of holiday gifts - be it stocking-stuffer items or small gifts for friends. Come visit me next week! This weekend, Todd and I went shopping and bought some really awesome display pieces for shows. Above are two metal racks that are perfect for necklaces! I'm going to spray them black so everything matches, and the taller rack will have a longer dowel added so that I can hang more. A three-panel corkboard that Todd helped me to assemble. I made it fold in a "Z" shape because I thought it was more interesting that way. The added benefit is that the whole display folds flat for travel! I stuck a few pieces on the board for the photo, but I think I'm going to spray the frames black and either paint or cover the cork with paper or fabric...to be decided. Then I also found these plates and trays on super super sale that I thought would be perfect for displaying bows and flowers. The blue plates are a tiny bit dinged, but I was able to purchase them for $0.68, so I think I can work with it! 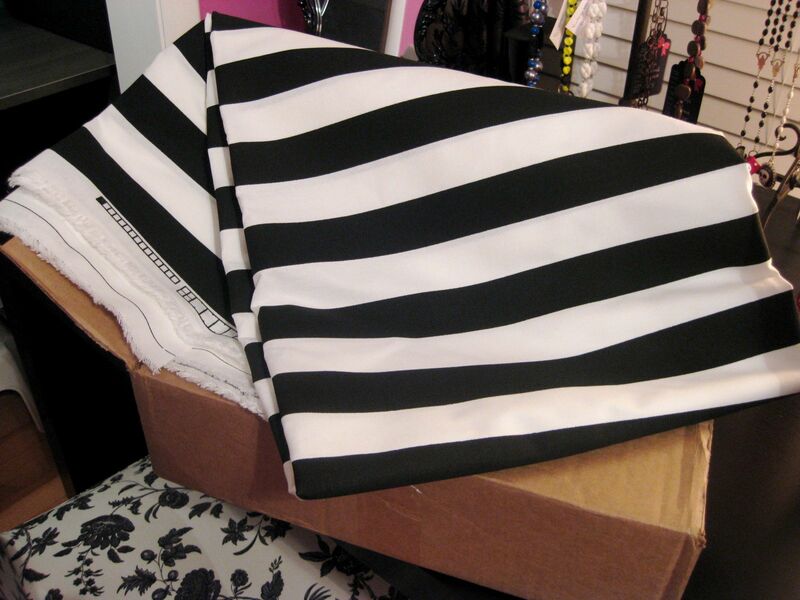 The only thing I was unable to purchase but I thought would be the easiest thing to find was striped fabric to make a tablecloth for shows. Who'da thought it would be so hard to find? I think I'm going to do some online hunting to find just the perfect fabric, and in the meantime I'm going to borrow my own kitchen tablecloth! So, I have all these great display pieces now, so I'm going to have to hunt for more places to get out and sell! I've been working on a couple of mini projects lately. One is the super-fun studio decoration Todd helped me hang yesterday. Now we have an official sign! Please consider coming to visit me at the Shops of Emerson on November 18th. 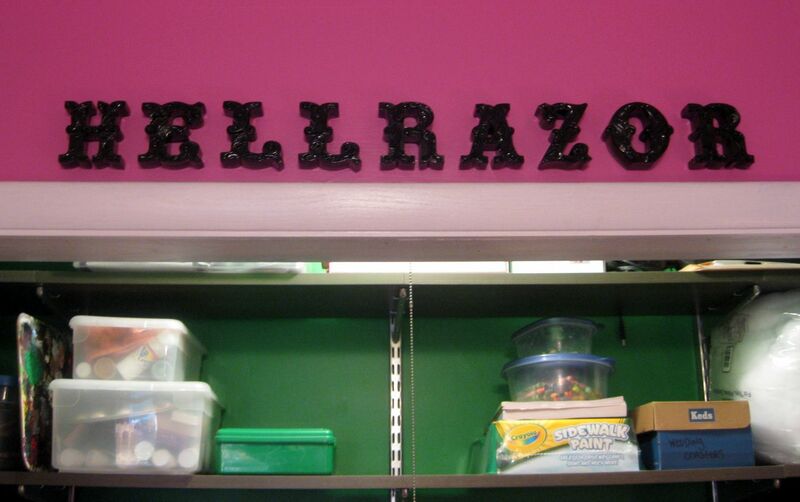 I'm listed as "Stuff by Mrs. Leban" since I can't exactly use "Hell Razor" at an elementary school. 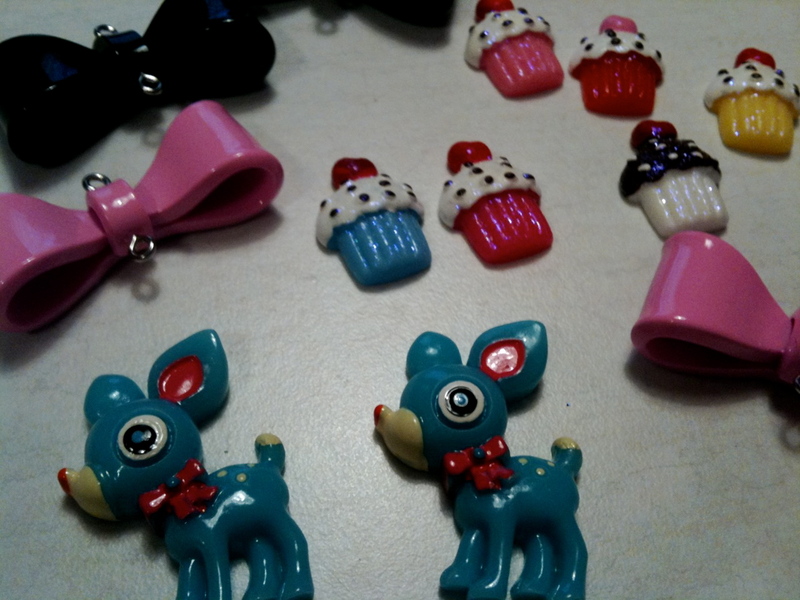 Your reward for trekking on over to visit is $5 deals on all earrings, bows, and flowers! Come holiday shop! So, if you follow me on Facebook or Twitter you've probably already heard that I didn't make it into the Renegade Holiday Craft Fair. That totally stinks, because I was really counting on it and I'm totally bummed. But I also know that one rejection doesn't mean that I should give up. 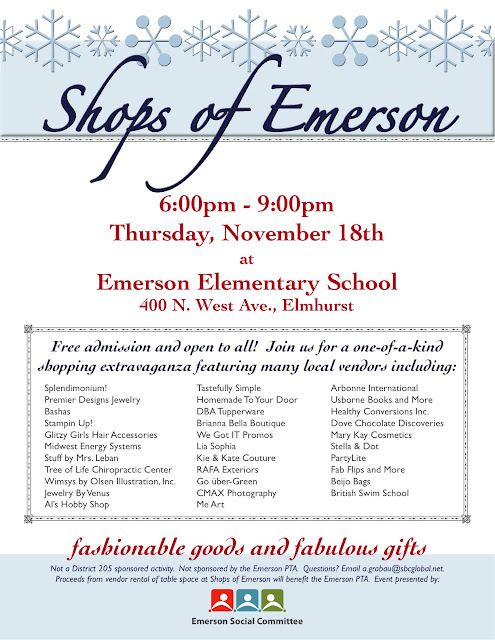 I am entered to be a vendor at a small fair at Emerson Elementary School in Elmhurst on Thursday, November 18th from 6-9 pm. The sad part is that it's an elementary school, so I can't exactly advertise under the "Hell Razor" name... yeah, not appropriate, especially seeing as I work in the district, so for the evening I'm going to operate under the very generic "Stuff by Mrs. Leban" moniker. The good part for anyone interested in purchasing items is that I'm planning on clearing out a lot of older items at quite a discount... I was thinking $5 each for flowers, bows, and earrings. I may also make some new very simple bows to sell as well, depends on the time I have before this. It's not the Renegade Fair... it's not even close... but it's something. And everyone has to start somewhere. A positive point is that it gives me an excuse to go buy a cash box of my very own which will most certainly need some sweet sweet decorations! I made a couple of new necklaces last week. I think they're kind of interesting to talk about, because they're both one of a kind designs - I only have the parts to make them once, and I can't purchase the parts over again. 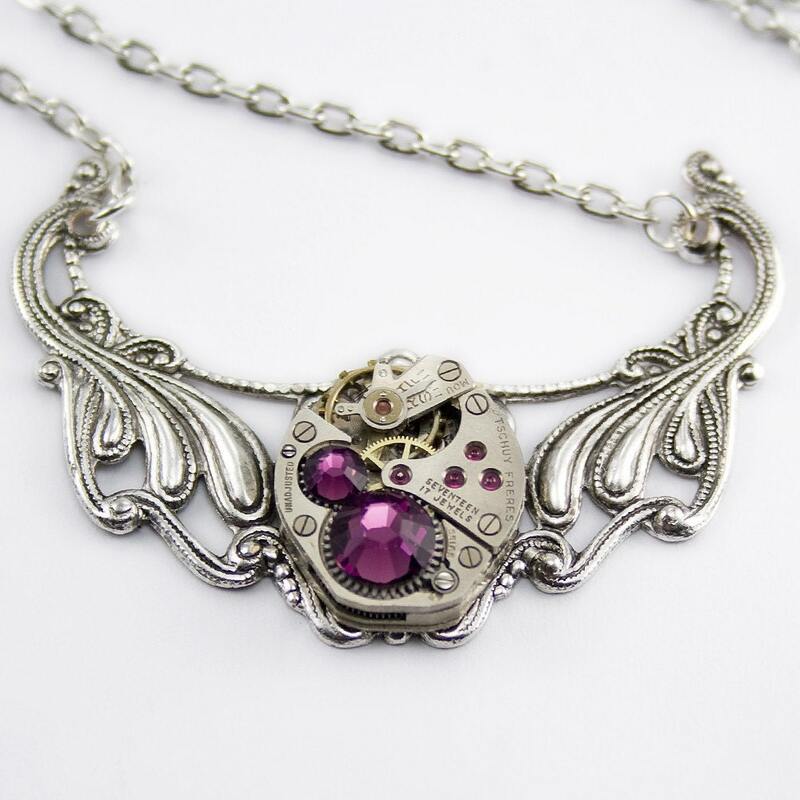 One design is the "Mystic Pyramid Watch" necklace, but the other is "Aunt Marty's Owl Necklace," pictured above. 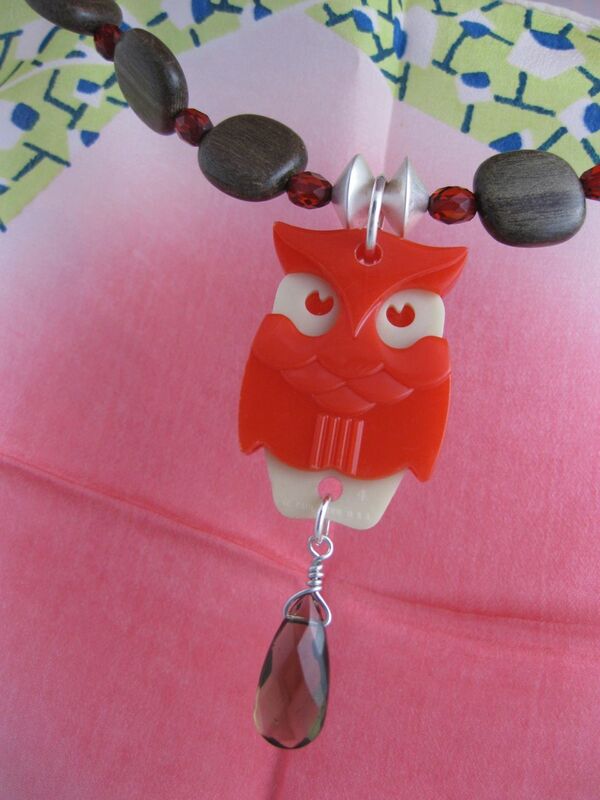 This owl necklace is actually a vintage keychain! I took the keychain, removed the parts, and connected it to a necklace via the top hole. The bottom hole is typically connected to a second keychain - it disconnects from the main owl body and would have typically been used for giving your keys to a valet or mechanic without giving away all of your keys. But I used the bottom hole to connect a drop dangle that complements the wooden beads on the necklace. 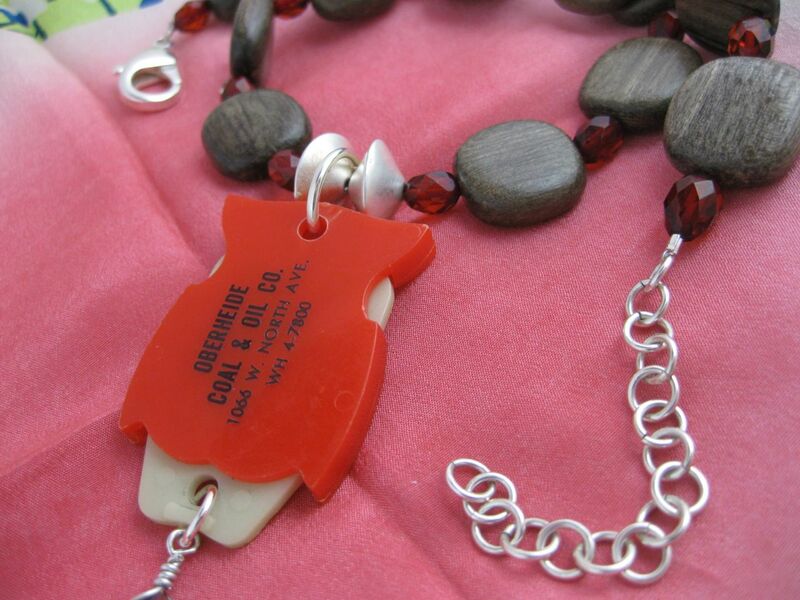 The red-orange beads between the wood beads come from a vintage necklace. When I go to garage sales and re-sale shops, I often look for interesting beads on necklaces I can purchase and take apart. After trying on the completed necklace, I realized it was a little short (for me anyways). A simple fix was to add an extender piece of chain - the links are actually hand-made by Todd! Now it's perfect. In the photo above, you can see the writing on it from the original keychain: "Oberheide Coal & Oil 1066 W. North Ave. WH 4-7800" I just thought the keychain was really cute and would look great as a pendant. Thankfully, our Aunt Marty was quite the collector, and after she passed away we discovered many wonderful treasures. 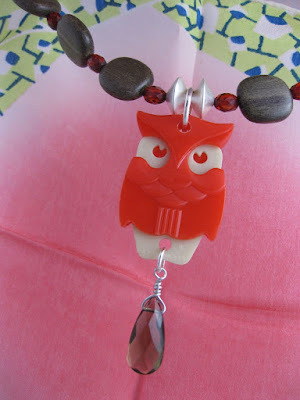 This owl was one of them, and I like to think that she would've gotten a kick out of how I recycled her old keychain. A collection of things sparkly, jewel-toned and antique feeling. Inspired by the seasons changing to fall. I went to the office supply store today to buy more printer ink (wheeeee!) and was super excited to find THIS in the pen aisle! Sharpie has a STAINLESS STEEL refillable model! I was all "whoa big baller Sharpie, I will put you in my basket" and then I realized how mean it would be to buy one and come home to gloat about it to Todd. So I bought him one, too. I told him that he should probably sit down before I gave him this surprise, that's how great it was. Can you tell we love Sharpies? This is soooo sweet. Oh yeah, I also bought retractable Sharpie pens, which I also love. 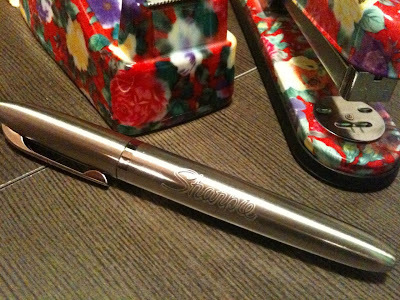 So if you're a Sharpie geek like us, go pick one up fer yerself. 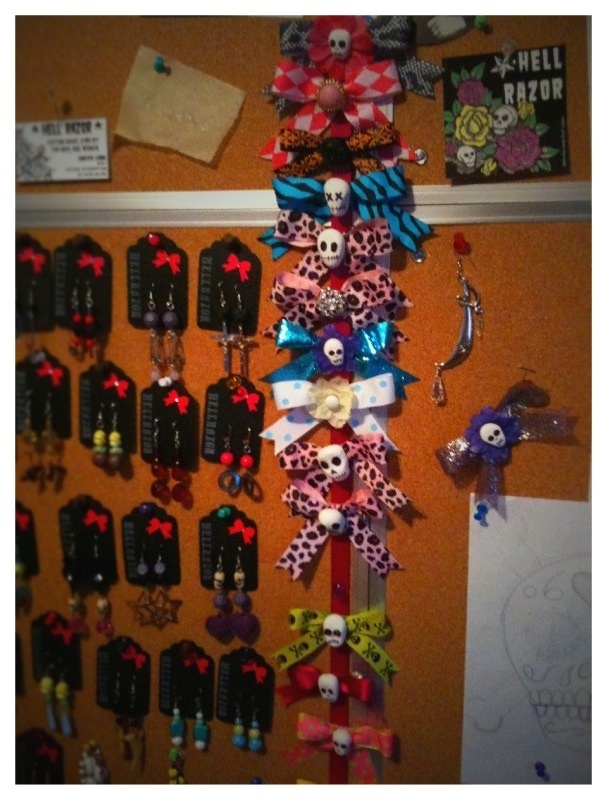 I was thinking that her idea might work pretty well for me, but now I wonder if my hair bows and flower clips also need tags like the earrings have. That's a lot of additional work, but if it's worth it in sales, I'm willing to do it. I have a mirror to use for craft shows, so people can try on pieces and check themselves out. 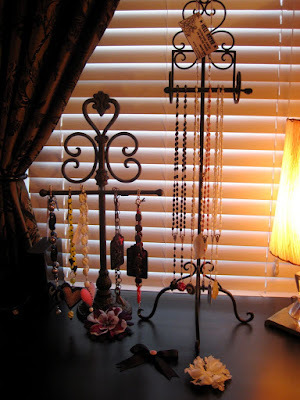 I'd really like something fun to display necklaces and earrings on, like a black candelabra, or something along those lines. 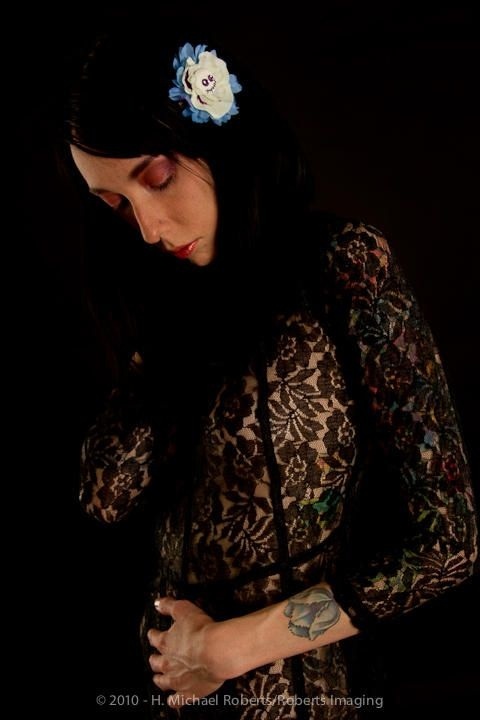 Although a lot of my stuff is girly, I want to stay dark and metal with it - not get all super pink with feather boas and shabby chic all over the place... if you know me, you definitely know what I mean. Girly and cute, without being annoyingly girly and cute. Got any ideas? Let me know what's worked for you, or what you think might work for me! 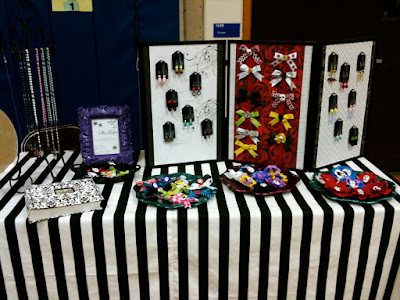 Yesterday I went to the Renegade Craft Fair, which is one of the biggest most awesome craft fairs in Chicago. We made the mistake of going after 4:30 pm, which means that we didn't actually arrive and find parking until after 5:15 pm. Meh. The fair closes at 7:00 pm, which meant very little time to properly browse and select our purchases. 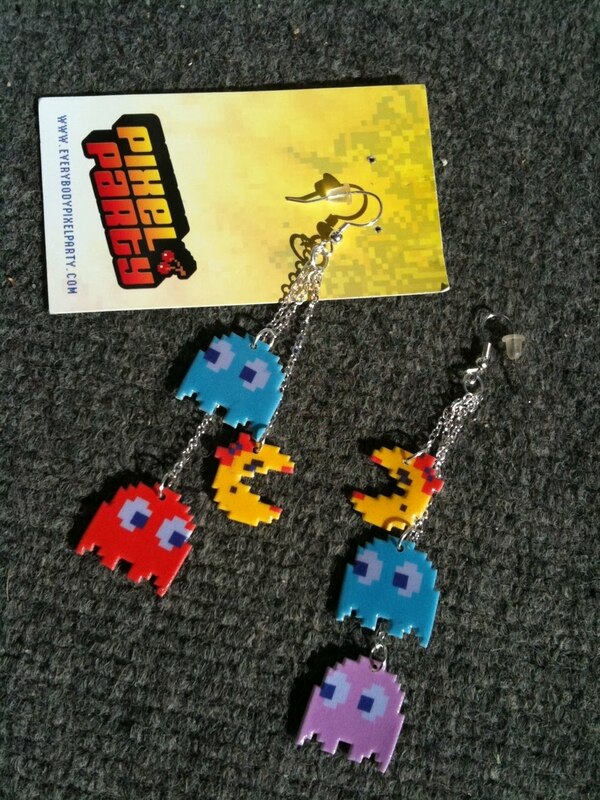 However, we did make a quick run around all the booths, and I didn't leave empty-handed! One of the first tents housed Steff Bomb's table, which my brother and I had met earlier in the year at Constructor craft fair. We were excited to see her stuff, and my friend Beth bought a grumblebuns, baby corn, and carrot from her. Pretty sweet. I picked up no less than a zillion business cards and looked up a bunch of them on Etsy afterwards. I also bought a Johnny Cash calavera t-shirt for my husband from MisNopalesArt and I'm deciding on which one to purchase for myself in the near future (all the designs are really good, so it's hard to pick just one). 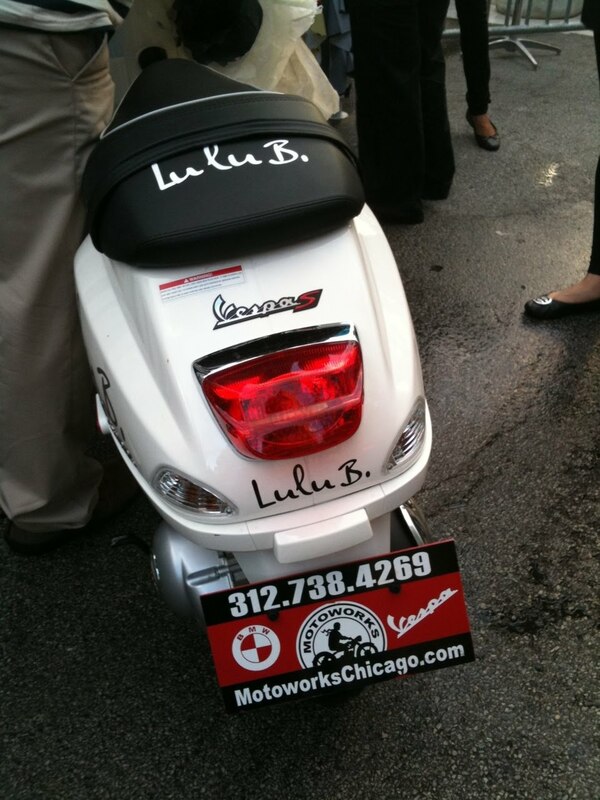 I was also excited to spot this scooter - first of all, I love Vespas and hope to have one of my own someday - but also because it was from Motoworks! Motoworks is a store that our really good friend works at. He was a groomsman in our wedding and hooked us up with motorcycle riding lessons from Motorcycle Riding School a few summers back. So always excited to see Motoworks show up around town. So, in the end, I LOVE LOVE LOVE the Renegade Craft Fair. Just wish I had even more time to walk around and browse! (Side note: the fair does run both Saturday and Sunday, so you could make this a 2-day affair. Unfortunately, I had other commitments.) I hope that next year I'll actually have a booth of my own. Of course, I'll have to bring extra helpers with me so I can walk around and shop too! I ordered some supplies from Etsy. These are from MimiLoLo, and they're really cute. I was also pleased at the quality of the materials. What will they become? That remains to be seen, but I had to share since they're so cute. Here is the newest custom piece I've made. It's for @carrionrun, and I think it turned out REALLY well. I always sketch out a bunch of ideas and sometimes even make trial versions of new things I haven't made before. There was some deliberation regarding the anarchy "A" whether or not to make the circle smaller or to size of the disc. As you can see, I decided the "A" needed to extend beyond the circle, so I shrunk it so the "A" could expand. Good choice. The double bow was also a new endeavor, as I had to come up with a solution that would not make the bow center stick out really far when I still had to add the anarchy center. Also successful! 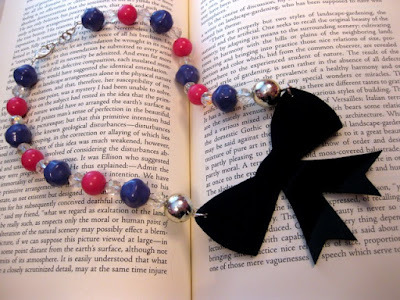 In fact, I really like the double bow combo and plan on making more of this type soon. Thank you @carrionrun and H. Michael Roberts Photography for the beautiful photo featuring a skully clip by Hell Razor! Below, see another awesome photo with @carrionrun. I love the mix of sepia and blue tones! Wow, I didn't even realize it's been 10 days since I last posted... eek! School started on August 19th. Needless to say, things are busyyyyyy. 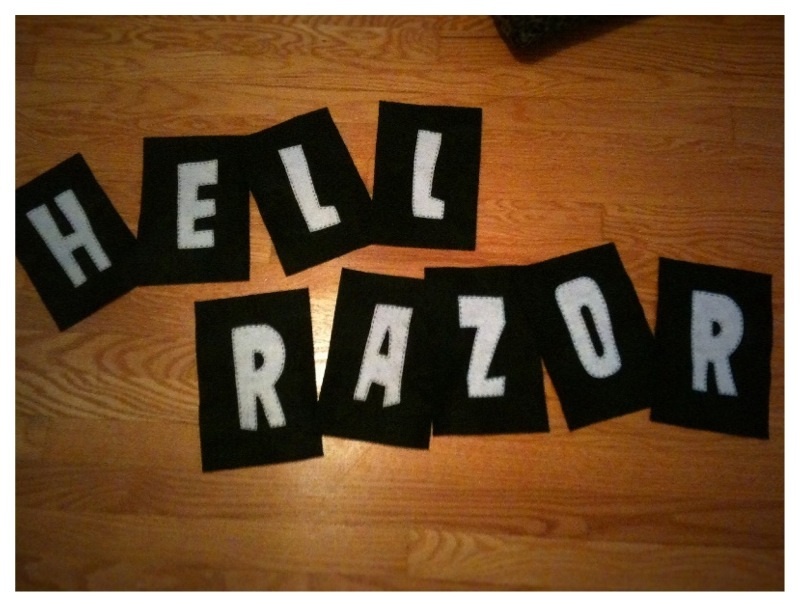 So Hell Razor gets put onto the list of "fun" things to do after the work gets done. Unfortunately, sometimes the work never gets done, and "fun" becomes a thing of the past. Sad! Maybe one day Hell Razor can become a full-time gig. But until then, duty calls! But back to fun now, at least for a few minutes. I've been recently featured in several different treasuries by Etsy members! 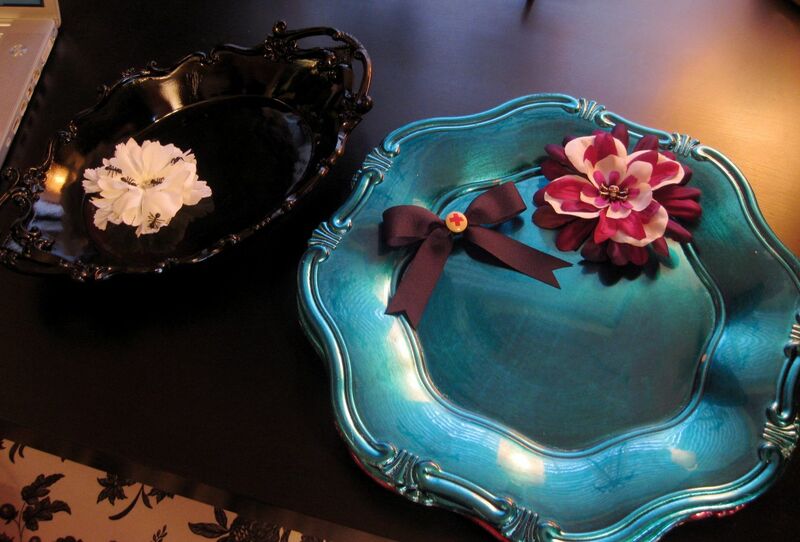 Treasuries are curated lists of items on Etsy by members. Treasuries typically have a common theme or unifying element. I made a treasury once (so far) but sadly it wasn't nearly as exciting as the ones that follow. Mine was called "I Like Stripes." Pretty creative, huh? The Blue & Black Skull Mini Hat was also featured in the treasury "Black and Blue and Silver All Over" by silverorchiddesign! I love that other people are looking around and noticing some of the things that I love to make. Please take a moment to check out the treasuries listed above and to browse the shops of the featured artists and curators!